Pear trees can be attacked by a range of pests but few cause real problems. 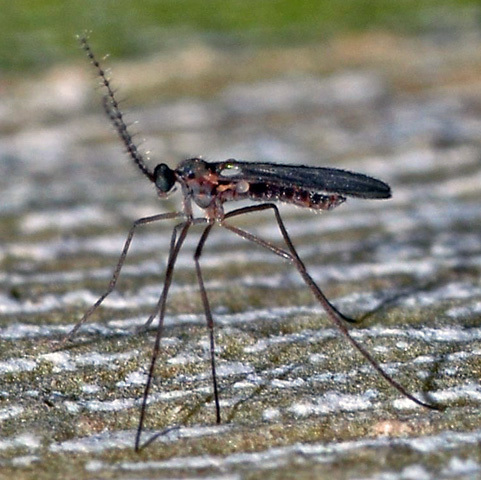 The most troublesome pests are gall midge and leaf blister mite. 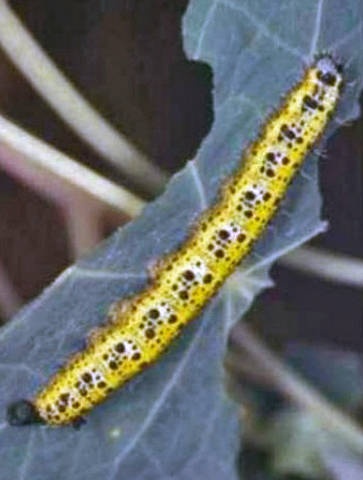 Grey aphids and winter moth caterpillars are quite common but not as troublesome. Fruit can also be damaged by codling moth caterpillars, wasps and birds. Aphids may attack new growth especially in early summer. They cause new shoots to curl and there is often a sticky honeydew can form over new growth. 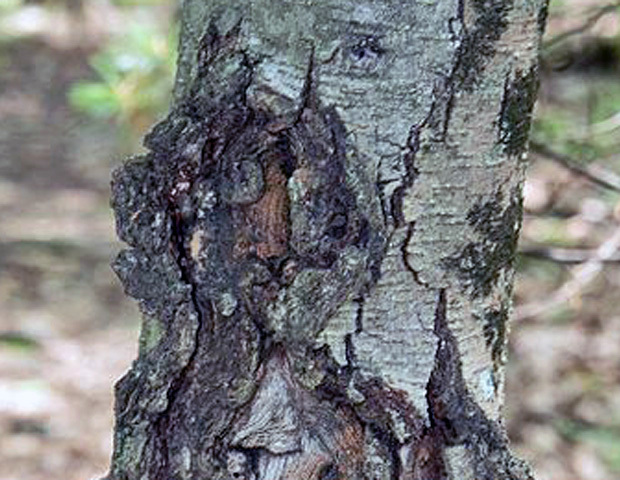 The symptoms are seen as deformed patches of bark which becomes cracked and bends inwards. In some seasons these can be a bit of a problem. The best treatment is to simply pick them off by hand as soon as they are noticed. Similarly, pick off any moth cocoons that may have formed. The signs that this disease is present come in spring when new growth turns brown and a sticky liquid appears around affected areas. 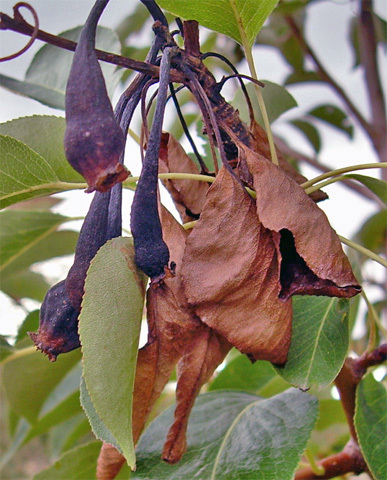 Seek advice from your local DEFRA office as fireblight is a notifiable disease. Gall midge is a tiny fly that lays eggs on the unopened flower buds hatching into orange-white maggots up to 3mm long, these feed on the young embryo. The affected fruit becomes enlarged then turns black. In late May to June, large numbers of young fruit drop from the tree. The maggots from within the fruit crawl into the soil to pupate. In spring cultivate the soil around the tree to expose these maggots / over-wintering midges to the cold and wild life. To control future problems, pick off and destroy the infected fruit before they drop. Small trees can be sprayed with a suitable insecticide when the blossom is at the white-bud stage. 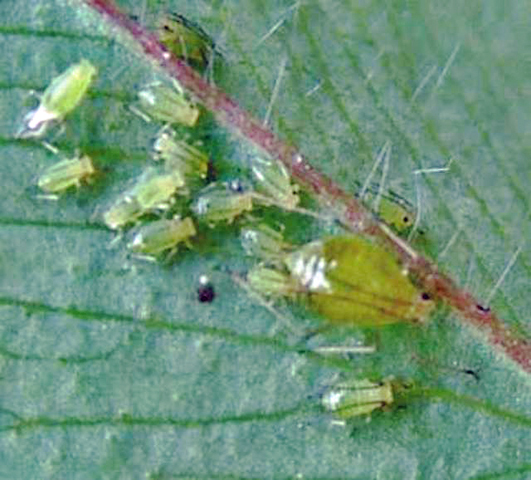 These mites live within the foliage, and several generations can occur during summer. The problem is first recognised in spring when the new foliage develops pink or pale green blotches that gradually become brownish black. During the growing season the tree/s can develop an generally unhealthy appearance, however this disfigurement seems to have little effect on overall vigour and the fruit is not affected. There are no effective pesticides for the amateur gardener and the only recourse is to remove affected leaves or shoots. Unlike many forms of rust, this pathogen requires two hosts to complete its life cycle, namely Pear and Juniper. The fungus first appears as orange spots on the upper leaf surface of pear trees, with corresponding brown growths underneath. The spores produced on these leaf spots are then windswept on to Junipers. Once affected, spindle-shaped swellings appear on the stems of junipers from which spores are produced, and in turn are blown back to re-infect the pears. Depending upon weather conditions these spores can travel up to 6 km (3miles), meaning both species need not be in the same garden to infect each other. 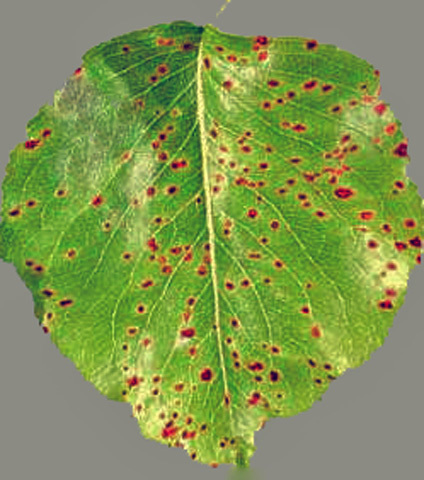 There are no approved fungicides available to the amateur gardener, but those labelled for pear scab and powdery mildew will give some control. If practical, the removal of junipers or pruning out of infections may give some control. 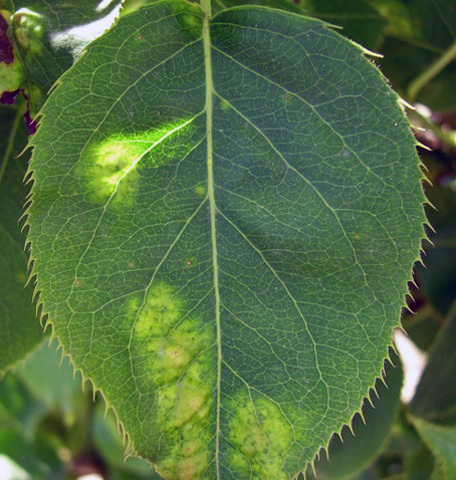 This fungal disease can be identified by brown scab like marks on the fruit and often black marks on the leaves. 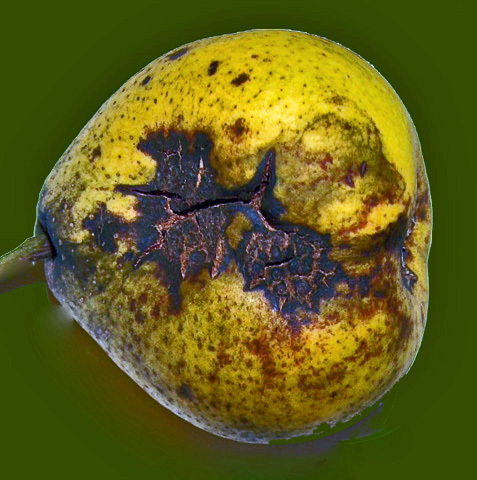 Some varieties of pear do not store very well and sometimes rot. Temperature is often a problem, in particular fluctuating temperatures. Store pears in a cool, moist, but not damp atmosphere, in an area that does not suffer from large temperature changes, 7°C (45°F) is ideal. Only store perfect specimens, any showing signs of bruising should be used up first. Lay them in one layer on a slatted surface, do not let adjacent fruit touch each other. Check them out every couple of days, and remove any that are showing signs of deterioration.